NorthBay & OLE Health: a Good Team! Katie Moore is grateful to the NorthBay Medical Center and its ER staff for their actions to save her life in 2017. Fairfield resident Katie Moore had just crawled into bed for the night but felt a sudden need to get back up. She sat up, but when she stood, she was instantly in distress. “I couldn’t get a breath in and I just fell to the floor,” she recalled. “I couldn’t breathe, I couldn’t stand back up and I couldn’t yell!” Unable to call for help, Katie managed to crawl to her housemate’s room and knock on the door. He opened the door and looked down at her as she managed to gasp “9-1-1” before passing out. The August 2017 incident was the start of a long journey for Katie to regain her health — one that began with an ambulance ride to the NorthBay Medical Center Emergency Room and continues today with the guidance of her NorthBay primary care doctor, respiratory experts and a team of specialists. While she praises the entire NorthBay team, including the staff in the NorthBay Medical Center Intensive Care Unit, where she would spend 17 days — Katie is most especially grateful to the emergency team. It’s not entirely clear what caused Katie to collapse, but she is diabetic and has respiratory disorders that she says were “out of control” at the time. 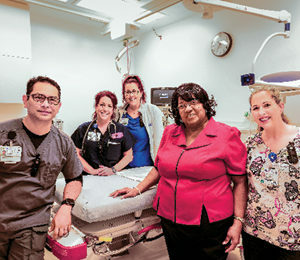 NorthBay Medical Center Emergency Department recently completed an expansion that increased the number of beds from 19 to 29. There are also new trauma bays — one devoted to cardiac resuscitation and three high-acuity beds with patient lifts. A new CT scanner will be moved into the department in April. On a ventilator, Katie was not responsive. Her children came to the hospital to be with her. And as they removed the tube, her eyes opened. From NorthBay, Katie would move to a rehabilitation facility in Sacramento, undergoing physical and speech therapy to regain her ability to walk and talk. With the help of her team of providers at NorthBay, Katie said she has learned how to eat healthy, has her blood pressure and diabetes under control, has lost 50 pounds and gained a new appreciation for life. Today she moves with the aid of a cane but is determined to get rid of it eventually. “I pushed myself because I wanted to walk and talk and I’m still pushing myself,” she said.